I mentioned the system we had at college (GABLE) developed originally at Sheffield University (headed by Bryan Lawson) and in its days was a pioneering combination of software that is one of the grand-daddies of the BIM software we see today. You can read a description of the software HERE in the 1986 CAD Directory! Well, it must have been about 1987 when one of the sons (who was probably only 12 or so) of the dear Oxford Architecture lecturer Layla Shamash (1943-2002) showed me a piece of software he had brought back from the US called ‘Schema’. 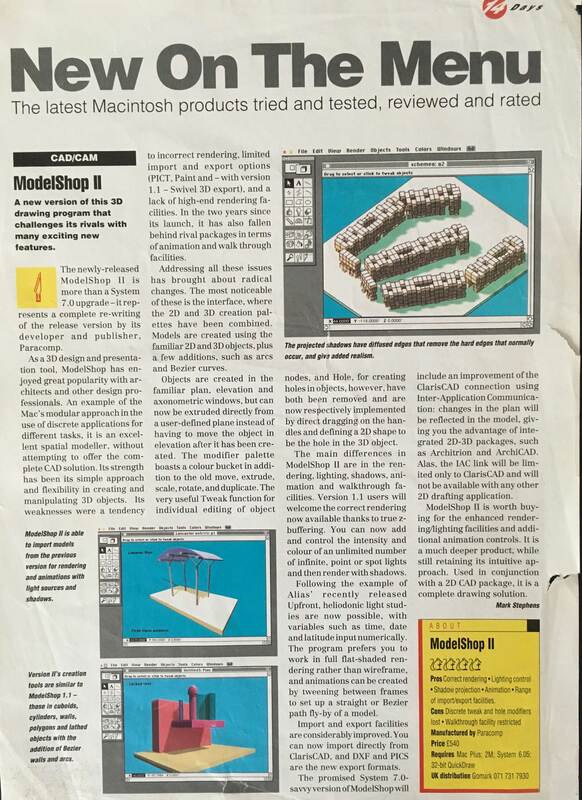 This went on to be ModelShop 1.0 ( and then upgraded to ModelShop II by Paracomp). 2. The first Schema model that Layla’s son showed me was a 3D model of Frank Lloyd Wright’s Robie House. Which incidentally killed the ease of use compared to GABLE – all on a single floppy disk!